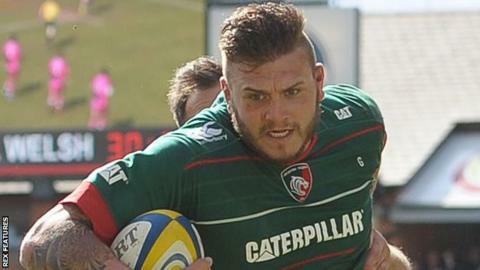 Sale Sharks have signed back-row forward Laurence Pearce from Leicester Tigers for next season. The 25-year-old has played 26 games for the Tigers, scoring eight tries. Pearce played rugby league for Hull FC and York City Knights, before crossing codes to play for Rotherham prior to his move to Leicester in 2014. "He is a dynamic ball-carrier, who will boost our already abrasive back five. I am so pleased Laurence has signed for us," boss Steve Diamond said. Pearce added: "I am delighted to be moving north to play for Sharks. "I would like to thank Leicester Tigers for giving me the opportunity to play in the Premiership and also the fans, who have been great to me since I joined from Rotherham."